Can we talk about how much I love Patti Smith? 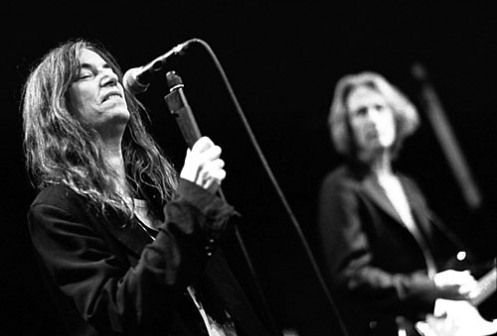 Patti Smith is kind of my hero. I like to think everyone knows who she is, but if you don’t, she’s a musician and writer who got her start as part of the punk movement in New York in the mid-1970’s. I think her most impressive skill is blending music with the written work, in life and on her albums. Inserting spoken word into music, especially iconic songs, is a risky business, but Patti does it phenomenally well. My second favorite albums of hers, Twelve, is a collection of covers to which she has given her own distinctive stamp (not unlike Johnny Cash’s 1,2,3 and 4). Her version of “Smells Like Teen Spirit” is by far my favorite, and her spoken word interlude creates a climax to the song, rather than deflating it. *I think she ad libs all her spoken word when she performs, even more impressive. Neil Young’s Helpless is also on Twelve. She’s also, unsurprisingly, a fabulous poet and memoirist. Her poetry collection Auguries of Innocence and her recently published memoir Just Kids are both among my favorite books. While she’s known for her tomboyish persona, her writing, especially her poetry, are a combination of her background in punk rock and avant garde art, her passion for the romantic poets like Rimbaud, Baudelaire and Blake, and the traditionally feminine concerns of motherhood and home. She’s the ideal renaissance woman. And a badass. ← Can We Talk About How Much I Love Lucky Peach? It’s funny. Patti used to live in Ann Arbor. And she used to go to the Halfway Inn (basement cafe in East Quad) to read the paper in the morning. I saw her there several times. Awesome! I knew she had some connection to the area. When was this?